A few months ago, I sat in church with tears streaming down my face like waterfalls. Just days before, I had been utterly disappointed and hurt by someone who I considered an ally simply because they said they were committed to racial reconciliation (that was my first mistake). Though I had experienced similar situations before. the familiarity of this injustice did not minimize the pain – in fact, its strange familiarity intensified the feelings of hopelessness that threatened to swallow me whole. I began to ask myself what was the point in fighting so hard if things wouldn’t change? What was the point in striving, pushing so hard against the elephant of racism if at the end of the day the elephant remained? “Then I looked again at all the acts of oppression which were being done under the sun. And behold I saw the tears of the oppressed and that they had no one to comfort them; and on the side of their oppressors was power, but they had no one to comfort them. So I congratulated the dead who are already dead more than the living who are still living. But better off than both of them is the one who has never existed, who has never seen the evil activity that is done under the sun” (Ecclesiastes 4.1-5, NASB). In this passage the preacher, assumed to be King Solomon, offers a candid picture of oppression and the lack of hope that many feel as a result of their situation. The repeated censoring, marginalization, and exploitation of the poor, women, and people of color, leaves many feeling overwhelmed with the pain that they encounter on a daily basis. In this country, much of the oppression exists along racial lines and those of color most often the victimized. From being turned down for a job, to being profiled and harassed by a police officer, we as people of color so often get the snot kicked out of us. We try, God knows we try hard, to move the elephant of racism that is literally killing us left and right. 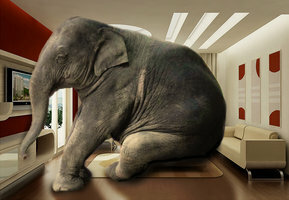 Every once in a while, he moves – the elephant actually shifts a little. Policies are passed that offer new promises of opportunity. White people start to listen and pay attention to our stories without centering themselves in it. A pastor recognizes and repents of his/her own role in maintaining racism and commits to the work of diversity and reconciliation. Finally! We are making progress. But then the elephant shifts right back to where he was before. Or maybe we were delusional and the elephant never really ever moved in the first place. Damn! The question is how do we maintain hope when nothing seems to shift. How do we keep holding on, fighting the good fight when things seem to remain the same? In light of all of the recent happenings of black men being profiled and killed, I feel like we are living in a time warp. I wasn’t alive in the 50s but what we are experiencing in 2014 sure does feel like a page from the civil rights movement of old. How do we maintain our hope for justice when we are stuck fighting the very same fight for mere existence that our ancestors did? The reality is that we do have hope. Jesus is our hope! His coming kingdom ushers in a new reality where those who have been victimized and those who have been silenced are made whole. When I think about this kingdom, the description of restoration from Joel 2 comes to mind where God makes up for all of the years of utter destruction and calamity that the nation of Israel endured at the hands of their enemies. In the process of restoration, God solidifies a reign of justice and peace where those who have been responsible for so much chaos are disarmed. At the same time, in this new reality, the oppressor no longer feels the need to compete, to control or to hoard resources at the expense of the vulnerable. Like the oppressed, they too are made whole and complete in this kingdom, resting confidently in the new identity that the resurrection brings. I imagine that in the context of our country, this means forsaking the doctrines and ideologies that have prioritized profit over people of color, including indigenous people and immigrants which include white supremacy, manifest destiny and more. It means letting go of the desire to have the strongest and most affluent economy in the world. It even means evaluating how we build this economy and resisting the temptation to build it by making rich off of black and brown bodies. It means adopting a new value system, creating a new mission in which to govern ourselves, throwing of policies and procedures that disinvest and embracing laws that give life to all regardless of the color of their skin. In this country, I imagine a time where the oppressed and the oppressor, black and white, poor and rich, slave and free – are all bound together in an inextricable embrace. The glue that binds us all is the blood of Christ, poured out for all, which not only tears down the walls of division between us but also fundamentally changes the nature of our relationships with each other. This is our hope! And in spite of what we continue to face on a daily basis, I refuse to give up on it. Whew! I needed this one this morning, Ebony! I spent most of yesterday afternoon sobbing and screaming about a racist interaction I had in the church. During this whole ordeal, I was brutally reminded of what happens when a so-called white male “ally” realizes that he can’t control me. Indeed, the elephant had not moved as much as I had thought. But you’re right, we STILL have hope…not in people, ideas, movements or institutions. Our hope is in Jesus who will never let us down like people do. Amen! 🙂 Absolutely. Sidenote: the experience that I referenced above had to do with a white male “ally” as well. Sigh.